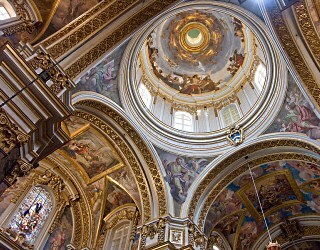 St. Paul’s Cathedral is a Roman Catholic cathedral in Mdina, in Malta. It is built on the site where governor Publius was reported to have met Saint Paul following his shipwreck off the Maltese coast. According to tradition, the first Cathedral of Malta was dedicated to the Blessed Virgin, Mother of God but, having fallen into ruin during the Muslim period, it was rebuilt following the Norman conquest and re-dedicated to St Paul. The old church was modified and enlarged several times. The building we can see today was designed by the architect Lorenzo Gafa. 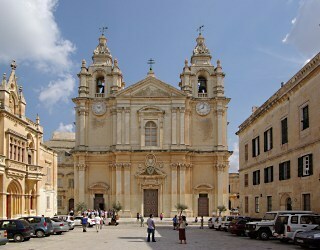 It was built between 1697 and 1702 to replace a ruined Norman cathedral destroyed by the 1693 earthquake on Malta. Despite this, several artifacts and edifices survived including the painting by the Calabrian artist Mattia Preti depicting the conversion of Saint Paul, a 15th-century Tuscan painting of the Madonna and Child, and frescoes in the apse which illustrate Paul’s shipwreck. The architect Lorenzo Gafa designed the Cathedral in Baroque style. It sits at the end of a rectangular square. The near-square facade is cleanly divided in three bays by the Corinthian order of pilasters. There are two bell towers at the both corners. The plan is a Latin cross with a vaulted nave, two aisles and two small side chapels. The Cathedral has a light octagonal dome, with eight stone scrolls above a high drum leading up to a neat lantern. One of the main features of the interior is the rich colorful tessellated floor. Many of the furnishings of the cathedral, including the baptismal font and the portal, are carved out of Irish wood. The cathedral also has a substantial collection of silver plates and coins, and some carvings by the German artist Albrecht Dürer. Photo of St Paul’s Cathedral floor by Plamen Agov, studiolemontree.com.